In almost every office of the world when it comes to money accountants come to excel. Although excel can handle money matters but when it comes to currency by default we have Dollar ($) as currency and not every country have this currency nor have the same currency sign. Accountants who are new often struggle with this fix. This involves changing the currency format on windows (operating system) level and that will push every application running on windows to use the currency symbol you so select. 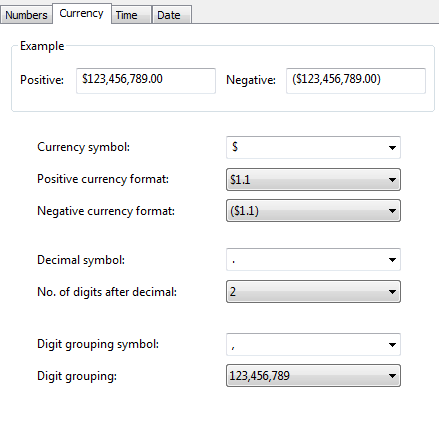 Step 7: In the currency format field type Rs or whatever currency symbol you desire. how decimals should be displayed in numbers. In different countries , (comma) is used to represent decimals and . (period or dot) is used to represent thousand’s separator. You can also change how numbers grouped i.e. thousands, millions etc or lacs, crores etc. So make your desired changes and the same will have effect in Excel directly. By temporary and limited I mean that this effect will be temporary and limited to workbook. If you open another workbook then you will have to repeat these steps again. 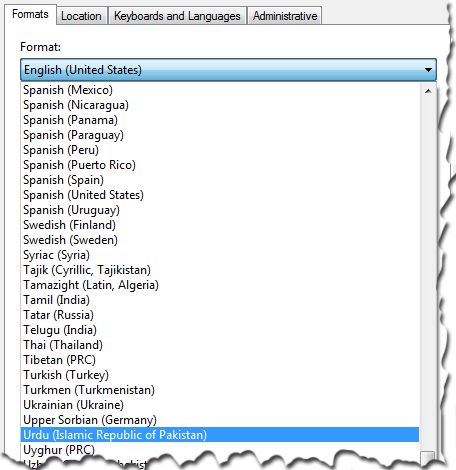 Step 2: In the dialogue box that appears click the symbol drop down menu and find “Rs (urdu)” or “PKR”. You will have to scroll slowly as list is a bit long and small movement makes the list to jump many lines. Step 1: Hit Ctrl+1, a shortcut to get the number format dialogue box up. You can also have it done by clicking the dialogue box icon at the bottom right corner of numbers group. Step 3: Same as step 2 in Way 1. Although the change can be brought easily using the methods discussed above but if for some reason the above provided solutions are not feasible then one can resort to custom number formatting feature of Excel. In the temporary method discussed above, the method actually involves changing the format of number in the cell. Remember that by changing format, most of the time you are only changing the look of the number but at the back end it is still old number. To know what exactly is stored in the cell after formatting the best way is to look at the formula bar having the cell selected in the editing mode. Type: this is where you can type in your custom format. By default it is General which you can replace with your own format. 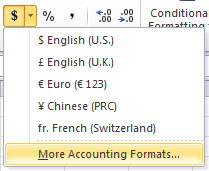 List: Just under type field you have a list of predefined or already used custom formats. You can select from one of them if it suits you. Alternatively you can use one of the examples discussed below. “Rs “* 0.00;”Rs “* (0.00) – Rs symbol added to number, however, symbol will be aligned left and number will be aligned right to the cell (just like accounting format). Numbers will be correct up to two decimal places and negative numbers are shown in brackets. “Rs “* 0.00_);”Rs “* (0.00) – Rs symbol added to number, however, symbol will be aligned left and number will be aligned right to the cell. By adding “_)” to positive numbers we ensured that even positive number take the same space in cell as negative numbers. Because of brackets negative numbers takes more space and because of that decimals don’t align properly with positive numbers. So we added a padding (space) to the right of positive numbers equal to one bracket i.e. “)”, Numbers will be correct up to two decimal places and negative numbers are shown in brackets. Previous articleWhat is age, aged, ageing or aging analysis? Next articleWhat is meant by CAATs? Thank you so much This helpful for me in the right time. Sir, I want excel sheet for the recording of Dr. / Cr. voucher to financial statements. can this possible on excel sheet or any other recording of book keeping soft wear with back-up & valid with out restriction (mean free).